Kathryn R. Fingar, Ph.D., M.P.H., Carol Stocks, Ph.D., R.N., Audrey J. Weiss, Ph.D., and Pamela L. Owens, Ph.D. This Healthcare Cost and Utilization Project (HCUP) Statistical Brief used data from 38 States—those for which inpatient data were available each year between 2006 and 2012—to examine the prevalence and costs of newborn and maternal inpatient hospital stays associated with substance use, including abuse of prescription drugs or use of illicit drugs or alcohol. Neonatal stays related to substance use were categorized according to the type of substance or substance-related condition: neonatal drug withdrawal, fetal alcohol syndrome, hallucinogens, cocaine, or unspecified narcotics. Maternal stays related to substance use were categorized according to the following types of substances: opiates, cocaine, cannabis, alcohol, other specified substances, or unspecified drugs. Rates of each type of substance and substance-related condition among neonatal and maternal stays were examined over time. Patient and hospital characteristics for neonatal and maternal stays related to substance use in 2012 are presented compared with all other neonatal and maternal stays. Differences between substance-related stays and all other neonatal and maternal stays of greater than 10 percent are noted in the text. 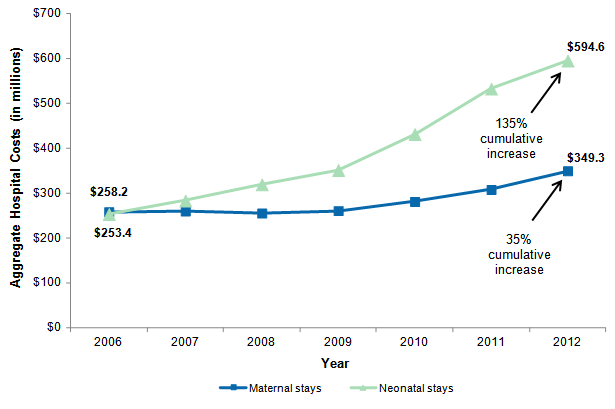 Figure 1 presents trends in the rate of neonatal and maternal hospital stays related to substance use from 2006 through 2012. Between 2006 and 2012, the rate of neonatal hospital stays related to substance use increased by 71 percent, from 5.1 to 8.7 per 1,000 neonatal stays, and associated aggregate hospital costs increased by 135 percent, from $253 to $595 million. Among maternal hospital stays related to substance use, the rate of stays increased by 33 percent, from 13.4 to 17.9 per 1,000 maternal stays, and aggregate hospital costs increased by 35 percent, from $258 to $349 million. From 2006 to 2012, the rate of neonatal and maternal stays related to cocaine decreased by more than 50 percent. Most neonatal stays with a substance-related condition in 2012 involved neonatal drug withdrawal (60 percent) or unspecified narcotics (23 percent), both of which more than doubled in rate from 2006. Twenty percent of neonatal stays with a substance-related condition in 2012 had low neonate birth weight compared with 7 percent of all other neonatal stays. In 2012, nearly one-fourth of maternal stays related to substance use involved opiates, and from 2006 to 2012 the rate increased by 135 percent, from 2.3 to 5.4 per 1,000 maternal stays. Mental disorders were indicated in one-fourth of maternal stays related to substance use in 2012 compared with 4 percent of other maternal stays. Note: Neonatal and maternal stays related to substance use were identified using all-listed conditions. Neonatal and maternal rates were calculated separately based on total neonatal or total maternal stays. Figure 1. Rate of neonatal and maternal hospital stays related to substance use, 2006-2012. 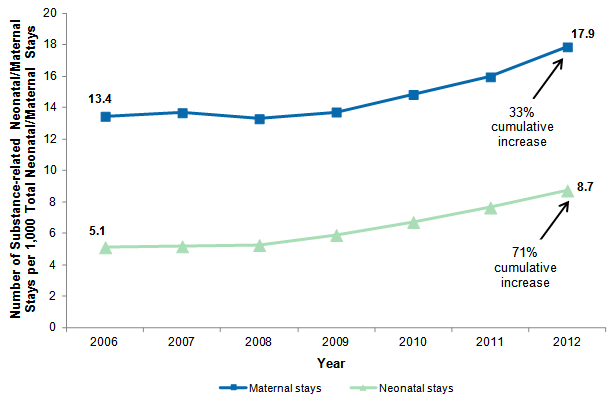 Figure 1 is a line graph that shows the number of substance-related neonatal and maternal stays per 1,000 total neonatal and maternal stays between 2006 and 2012. The number of substance-related maternal stays per 1,000 maternal stays was 13.4 in 2006, 13.7 in 2007, 13.3 in 2008, 13.7 in 2009, 14.8 in 2010, 16.0 in 2011, and 17.9 in 2012, for a total cumulative increase of 33% over the 2006-2012 time period. The number of substance-related neonatal stays per 1,000 neonatal stays was 5.1 in 2006, 5.2 in 2007, 5.3 in 2008, 5.9 in 2009, 6.7 in 2010, 7.7 in 2011, and 8.7 in 2012, for a total cumulative increase of 71% over the 2006-2012 time period. The rate of neonatal and maternal stays related to substance use increased substantially between 2006 and 2012. The rate of neonatal hospital stays involving substance use had a cumulative increase of 71 percent between 2006 and 2012, from 5.1 to 8.7 per 1,000 neonatal stays. The rate of maternal hospital stays involving substance use had a cumulative increase of 33 percent, from 13.4 per 1,000 maternal stays in 2006 to 17.9 per 1,000 maternal stays in 2012. In 2006, the rate of maternal stays related to substance use was 2.6 times the rate of neonatal stays related to substance use; in 2012, the rate of substance-related maternal stays was also more than double the rate of substance-related neonatal stays (2.1 times higher). Figure 2 presents trends in aggregate hospital costs for neonatal and maternal stays related to substance use from 2006 through 2012. Costs are inflation adjusted and expressed in 2012 dollars. Notes: Neonatal and maternal stays related to substance use were identified using all-listed conditions. Inflation-adjusted costs are presented in 2012 dollars. Figure 2. Inflation-adjusted aggregate hospital costs for neonatal and maternal stays related to substance use, 2006-2012. Figure 2 is a line graph that shows inflation-adjusted aggregate hospital costs for substance-related neonatal and maternal stays between 2006 and 2012. Aggregate hospital costs for substance-related neonatal stays was $253.4 million in 2006, $283.2 million in 2007, $319.1 million in 2008, $351.2 million in 2009, $431.2 million in 2010, $532.1 million in 2011, and $594.6 million in 2012, for a total 135% cumulative increase over the 2006-2012 time period. Aggregate hospital costs for substance-related maternal stays was $258.2 million in 2006, $260.0 million in 2007, $255.2 million in 2008, $260.6 million in 2009, $281.2 million in 2010, $307.6 million in 2011, and $349.3 million in 2012, for a total 35% cumulative increase over the 2006-2012 time period. Costs for neonatal stays related to substance use increased by 135 percent between 2006 and 2012; costs for maternal stays related to substance use grew by only 35 percent. Between 2006 and 2012, inflation-adjusted aggregate hospital costs for neonatal stays related to substance use had a cumulative increase of 135 percent, from $253.4 million in 2006 to $594.6 million in 2012. The cumulative increase in costs for maternal stays related to substance use was only 35 percent over the 6-year period. Although costs for neonatal and maternal stays related to substance use were similar in 2006 at approximately $250 million, in 2012 hospital costs for neonatal stays related to substance use were 1.7 times greater than costs for maternal stays related to substance use. Taken together, total costs for substance-related neonatal and maternal stays were $944 million in 2012. 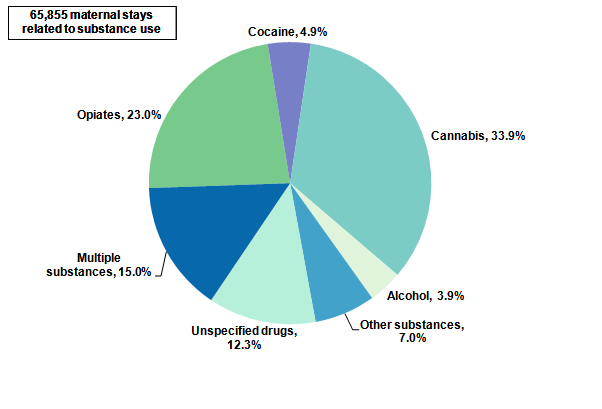 Figure 3 presents the distribution of neonatal hospital stays related to substance use in 2012 according to the type of substance or substance-related condition that was present. Note: Neonatal stays were assigned to mutually exclusive categories based on all-listed conditions using the following hierarchy: (1) "multiple substances or conditions" if more than one known substance or condition was indicated, (2) specific substance or condition (i.e., neonatal drug withdrawal, cocaine, hallucinogens, fetal alcohol syndrome) if only one known substance or condition was indicated, and (3) "unspecified narcotics" if only unspecified narcotics were indicated. Source: Agency for Healthcare Research and Quality (AHRQ), Center for Delivery, Organization, and Markets, Healthcare Cost and Utilization Project (HCUP), State Inpatient Databases (SID) from 38 States, 2012. Figure 3. Neonatal hospital stays related to substance use by type of substance or substance-related condition, 2012. 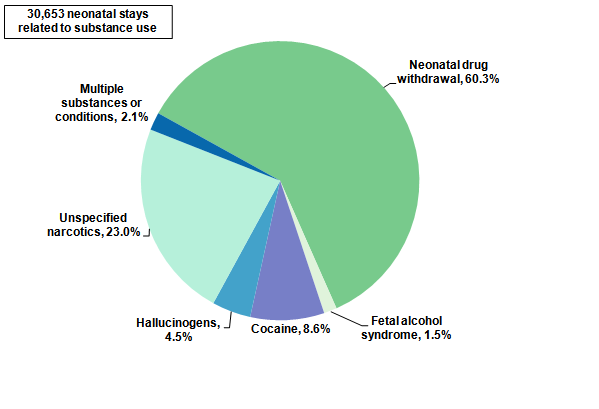 Figure 3 is a pie chart that shows the percentage of neonatal hospital stays by type of substance or substance-related condition in 2012. Of the total of 30,653 neonatal stays in 2012 related to substance use, 60.3% were for neonatal drug withdrawal, 23.0% were for unspecified narcotics, 8.6% were for cocaine, 4.5% were for hallucinogens, 2.1% were for multiple substances or conditions, and 1.5% were for fetal alcohol syndrome. Of the 30,653 neonatal hospital stays related to substance use in 2012, most involved neonatal drug withdrawal or unspecified narcotics. The vast majority of neonatal hospital stays related to substance use in 2012 involved either neonatal drug withdrawal (60.3 percent) or unspecified narcotics (23.0 percent). The remaining 16.7 percent of neonatal stays involved specific types of substances: cocaine (8.6 percent of stays), hallucinogens (4.5 percent), multiple substances or conditions (2.1 percent), or fetal alcohol syndrome (1.5 percent). Figure 4 presents the distribution of maternal hospital stays related to substance use in 2012 according to the type of substance that was present. Notes: Maternal stays were assigned to mutually exclusive categories based on all-listed conditions using the following hierarchy: (1) "multiple substances" if more than one known substance was indicated, (2) specific substance (i.e., opiates, cocaine, cannabis, alcohol, other) if only one known substance was indicated, and (3) "unspecified drugs" if only unspecified drugs were indicated. "Other substances" includes hallucinogens, psychostimulants, sedatives, antidepressants, absinthe, glue, inhalants, and phencyclidine. Figure 4. Maternal hospital stays related to substance use by type of substance, 2012. Figure 4 is a pie chart that shows the percentage of maternal hospital stays by type of substance in 2012. Of the total of 65,855 maternal stays in 2012 related to substance use, 33.9% were for cannabis, 23.0% were for opiates, 15.0% were for multiple substances, 12.3% were for unspecified drugs, 7.0% were for other substances, 4.9% were for cocaine, and 3.9% were for alcohol. Of the 65,855 maternal hospital stays related to substance use in 2012, one-third involved cannabis and nearly one-fourth involved opiates. The majority of maternal hospital stays related to substance use in 2012 involved either cannabis (33.9 percent) or opiates (23.0 percent). Another 31 percent of maternal stays also involved specific types of substances: multiple substances (15.0 percent of stays), other specified substances (e.g., hallucinogens and sedatives; 7.0 percent), cocaine (4.9 percent), and alcohol (3.9 percent). The remaining 12.3 percent of maternal stays related to substance use involved unspecified drugs. Table 1 presents the number, rate, and cumulative percentage change in rate from 2006 to 2012 for neonatal and maternal hospital stays related to substance use by the type of substance or substance-related condition. Note: Substances were identified using all-listed conditions. If more than one type of substance was identified, the stay was counted in the row for each type of substance. Therefore, the numbers of stays for specific types of substances and substance-related conditions do not add up to the total number of substance-related stays. "Other substancesFigure 4 presents the distribution of maternal hospital stays related to substance use in 2012 according to the type of substance that was present. includes hallucinogens, psychostimulants, sedatives, antidepressants, absinthe, glue, inhalants, and phencyclidine. Cumulative percentage change was calculated from rates that were not rounded. Among neonatal stays, the rate of stays with neonatal drug withdrawal increased by 187 percent and the rate of stays related to cocaine decreased by 60 percent from 2006 to 2012. The most rapidly increasing substance or substance-related condition among neonatal hospital stays was neonatal drug withdrawal, which increased by 187 percent, from 1.9 per 1,000 neonatal stays in 2006 to 5.4 per 1,000 neonatal stays in 2012. The rate of neonatal stays with unspecified narcotics also increased substantially across the 6-year period—by 149 percent—from 1.0 to 2.5 per 1,000 neonatal stays. The rate of neonatal stays with neonatal drug withdrawal was more than twice the rate of neonatal stays for any other type of substance or substance-related condition in 2012. In 2006, the rate of neonatal stays related to cocaine was higher than the rate of neonatal stays for any other type of substance or substance-related condition. Neonatal hospital stays related to cocaine subsequently decreased by 60 percent, from 2.2 per 1,000 neonatal stays in 2006 to 0.9 per 1,000 neonatal stays in 2012. Among maternal stays, the rate of stays related to opiates increased by 135 percent and the rate of stays related to cocaine decreased by 51 percent from 2006 to 2012. Between 2006 and 2012, maternal hospital stays related to opiates had the most rapid change in rate among maternal stays related to substance use, with a 135 percent increase, from 2.3 to 5.4 per 1,000 maternal stays. Substantial increases also occurred in the rate of maternal stays with unspecified drugs (68 percent increase) and cannabis (51 percent increase). Similar to neonatal stays, maternal stays related to cocaine had a notable decrease of 51 percent, from 4.0 per 1,000 maternal stays in 2006 to 2.0 per 1,000 maternal stays in 2012. Table 2 presents characteristics of neonatal hospital stays related to substance use compared with all other neonatal stays that were not related to substance use in 2012. Compared with all other neonatal stays in 2012, Medicaid was more likely and private insurance was less likely to be the expected primary payer among neonatal stays related to substance use. In 2012, Medicaid was the expected primary payer for 79.9 percent of neonatal stays related to substance use compared with 46.2 percent of all other neonatal stays. Substance-related neonatal stays were also more likely to be uninsured, compared with all other neonatal stays (5.6 vs. 3.9 percent). In contrast, private insurance was the expected primary payer for 11.8 percent of neonatal stays involving substance use versus 46.4 percent of all other neonatal stays. In 2012, neonatal stays related to substance use were more likely than other neonatal stays to occur among patients from communities with a lower median household income and less likely to occur in large metropolitan areas. Compared with all other neonatal stays, neonatal stays related to substance use were more likely to be for neonates from communities with low median household income (39.0 vs. 26.8 percent in the lowest income quartile). Neonatal stays related to substance use were less likely than other neonatal stays to be for neonates from large metropolitan areas (48.0 vs. 57.7 percent). Low birth weight, seizures, respiratory distress, and difficulty feeding were more likely to occur among neonatal stays related to substance use than among other neonatal stays. Compared with all other neonatal stays, those neonatal stays related to substance use were more likely to involve low birth weight (20.3 vs. 6.7 percent), seizures (1.4 vs. 0.3 percent), respiratory distress (30.1 vs. 10.0 percent), and difficulty feeding (16.2 vs. 3.8 percent). Neonatal stays related to substance use were approximately 4 times as long and 4 times as costly as other neonatal stays. The mean length of stay was 14.7 days for neonatal stays related to substance use compared with 3.7 days for other neonatal stays. Similarly, average hospital costs were substantially more for neonatal stays related to substance use ($19,684) than for other neonatal stays ($4,500). Table 3 presents characteristics of maternal hospital stays related to substance use compared with all other maternal stays that were not related to substance use in 2012. Maternal stays related to substance use were more likely than other maternal stays to involve young women aged 20-24 years and to have Medicaid as the expected primary payer. In 2012, nearly one-third (32.1 percent) of maternal stays related to substance use were for women aged 20-24 years compared with 23.0 percent of all other maternal stays. Medicaid was the expected primary payer for 75.0 percent of maternal stays related to substance use compared with 44.2 percent for all other maternal stays. Substance-related maternal stays were also more likely to be uninsured than all other maternal stays (5.4 vs. 2.8 percent). In contrast, private insurance was the expected primary payer for 13.7 percent of maternal stays involving substance use versus 49.0 percent of all other maternal stays. Compared with all other maternal stays, those related to substance use were more likely to occur among patients in communities with a lower median household income and less likely to occur in large metropolitan areas. Maternal stays related to substance use were more likely than other maternal stays to be for women from communities with low median household income (42.2 vs. 27.3 percent in the lowest income quartile). Additionally, compared with all other maternal stays, maternal stays related to substance use were less likely to be for women from large metropolitan areas (51.1 vs. 58.0 percent). Over one-fourth of maternal stays related to substance use included mental disorders as a co-occurring condition. Maternal stays related to substance use were substantially more likely than all other maternal stays to include mental disorders as a co-occurring condition (26.1 vs. 3.9 percent). Compared with all other maternal stays, those related to substance use also were more likely to involve chronic pain (2.1 vs. 0.1 percent). CCS categorizes ICD-9-CM diagnoses and procedures into a manageable number of clinically meaningful categories.8 This clinical grouper makes it easier to quickly understand patterns of diagnoses and procedures. CCS categories identified as Other typically are not reported; these categories include miscellaneous, otherwise unclassifiable diagnoses and procedures that may be difficult to interpret as a group. Neonatal: Diagnoses 27701, 74783, 76061-76064, 76077-76078, 7620-7706, 77081-7785, 7787-7796, 77981-7799, 7966, V2031-V2032, and V290-V392. Neonatal records were restricted to neonates aged <1 year. Maternal: Diagnoses 630-67914, 7923, 7965, V220-V2384, V2386-V242, V270-V282, V286-V2889, V616-V617, V6511, V7242, and V8901-V8909, and V9100-V9199. Procedures 720-7537 and 754-7599. Maternal records were restricted to females aged 15-45 years. Substance-related ICD-9-CM codes were selected that indicated alcohol or illicit drug use during pregnancy. Illicit drug use was defined as the use of illegal drugs or misuse of prescription drugs or other substances. Tobacco use was not examined. Codes were excluded if (1) it could not be determined that substance use occurred during pregnancy or (2) the code pertained to prescription drugs and it could not be determined whether the substance was misused or the effect was iatrogenic (i.e., induced inadvertently by medical treatment). Table 4 provides the ICD-9-CM diagnosis codes that were used to identify the substances and substance-related conditions among neonatal and maternal stays related to alcohol or illicit drug use during pregnancy. Total hospital charges were converted to costs using HCUP Cost-to-Charge Ratios based on hospital accounting reports from the Centers for Medicare & Medicaid Services (CMS).10 Costs reflect the actual expenses incurred in the production of hospital services, such as wages, supplies, and utility costs; charges represent the amount a hospital billed for the case. For each hospital, a hospital-wide cost-to-charge ratio is used. Hospital charges reflect the amount the hospital billed for the entire hospital stay and do not include professional (physician) fees. Fingar KR (Truven Health Analytics), Stocks C (AHRQ), Weiss AJ (Truven Health Analytics), Owens PL (AHRQ). Neonatal and Maternal Hospital Stays Related to Substance Use, 2006-2012. HCUP Statistical Brief #193. July 2015. Agency for Healthcare Research and Quality, Rockville, MD. http://www.hcup-us.ahrq.gov/reports/statbriefs/sb193-Neonatal-Maternal-Hospitalizations-Substance-Use.pdf. 1 Hudak ML, Tan RC, The Committee on Drugs, The Committee on Fetus and Newborn. Neonatal Drug Withdrawal. Clinical Report. Pediatrics. 2012;129(2);e540-60. http://pediatrics.aappublications.org/content/129/2/e540.full#T2. Accessed November 10, 2014. 3 Floyd RL, O'Connor MJ, Sokol RJ, Bertrand J, Cordero JF. Recognition and prevention of fetal alcohol syndrome. Obstetrics & Gynecology. 2005;106(5 Pt 1):1059-64. 4 Hudak et al., 2012. 5 Patrick SW, Schumachr RE, Benneworth BD, Krans EE, McAllister, JM, Davis MM. Neonatal abstinence syndrome and associated health care expenditures: United States, 2000-2009. JAMA. 2012;307(18):1934-40. 6 Centers for Disease Control and Prevention. Vital Signs: Overdoses of Prescription Opioid Pain Relievers—United States,1999-2008. Morbidity and Mortality Weekly Report (MMWR). 2011;60(43):1-6. 7 Hamilton BE, Martin JA, Ventura SJ. Births: Preliminary Data for 2012. National Vital Statistics Reports. 62(3). Hyattsville, MD: National Center for Health Statistics. 2013. http://www.cdc.gov/nchs/data/nvsr/nvsr62/nvsr62_03.pdf. Accessed November 11, 2014. 8 Agency for Healthcare Research and Quality. HCUP Clinical Classifications Software (CCS). Healthcare Cost and Utilization Project (HCUP). Rockville, MD: Agency for Healthcare Research and Quality, Rockville, MD. Updated November 2014. http://www.hcup-us.ahrq.gov/toolssoftware/ccs/ccs.jsp. Accessed January 7, 2015. 9 Agency for Healthcare Research and Quality. AHRQ QI, Prevention Quality Indicators #9, Technical Specifications, Low Birth. Weight Rate. Rockville, MD: Agency for Healthcare Research and Quality. August 2011. http://www.qualityindicators.ahrq.gov/Downloads/Modules/PQI/V43/TechSpecs/PQI%2009%20Low%20Birth%20Weight%20Rate.pdf. Accessed November 11, 2014. 10 Agency for Healthcare Research and Quality. HCUP Cost-to-Charge Ratio (CCR) Files. Healthcare Cost and Utilization Project (HCUP). 2001-2012. Rockville, MD: Agency for Healthcare Research and Quality. Updated August 2013. http://www.hcup-us.ahrq.gov/db/state/costtocharge.jsp. Accessed January 7, 2015. 11 U.S. Bureau of Economic Analysis. National Income and Product Account Tables, Table 1.1.4 Price Indexes for Gross Domestic Product. http://www.bea.gov/iTable/iTable.cfm?ReqID=9&step=1#reqid=9&step=1&isuri=1. Accessed August 25, 2014. Internet Citation: Statistical Brief #193. Healthcare Cost and Utilization Project (HCUP). May 2016. Agency for Healthcare Research and Quality, Rockville, MD. www.hcup-us.ahrq.gov/reports/statbriefs/sb193-Neonatal-Maternal-Hospitalizations-Substance-Use.jsp.